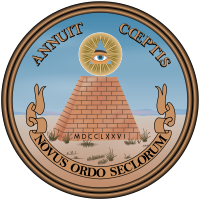 In the eagle's dexter talon an olive branch; in its sinister talon thirteen arrows; in its beak, a scroll bearing the motto; the reverse bears "A pyramid unfinished. In the zenith an eye in a triangle, surrounded by a glory, proper." 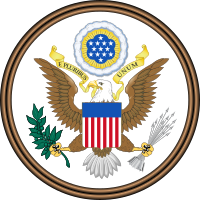 Edidi Gbangba Orile-ede Amerika (The Great Seal of the United States) ni won fi se imudaju awon iwe ijoba apapo Orile-ede Amerika.